Experience Optimism: What does Santa eat for breakfast? What does Santa eat for breakfast? According to the Optimist Club of Coquitlam, British Columbia, Santa Claus eats pancakes for breakfast. In fact, I believe most Optimist Clubs in North America believe in that menu for the jolly old elf and his friends. Optimist Clubs have been serving up pancakes to the delight of youngsters throughout the US and Canada for more than twenty-five years. In addition to the pancakes, they take pictures with Santa for the children to take home and some give them early gifts. But I think the best part about Breakfast with Santa is the opportunity for adults to interact with the wonderful young participants for their enthusiasm, smiles and squeals of delight remind us all of what being an Optimist is all about. 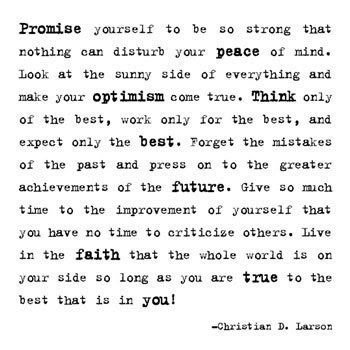 Picture courtesy of the Optimist Club of Coquitlam, British Columbia. 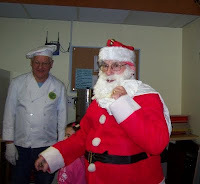 Optimist Club Chef Hal Griffin looks on as Santa greets his happy guests.